Here is the ultimate test of equine trust and respect: Taming a wild mustang in 100 days. Here are three secrets we learned from the professionals. The challenge: The Mustang Heritage Foundation created the Extreme Mustang Makeover event in order to recognize and highlight the value of Mustangs through a national training competition. The event allows trainers from all over America to showcase the beauty, versatility and trainability of the rugged horses that are housed at Bureau of Land Management facilities. After being selected to compete at an Extreme Mustang Makeover event, a trainer picks up an American Mustang that has been virtually untouched by humans. The trainer has 100 days to gentle, halter break and saddle train the Mustang, and they must do it by building a trusting relationship with their horse. AnnMarie and Mark Cross, founders of CrossWinds Equine Rescue in Sidell, IL, have successfully competed in the event. 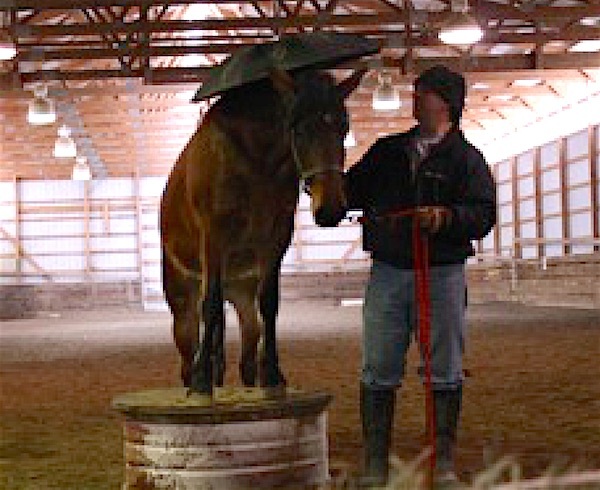 According to these compassionate and talented trainers, THE FUNDAMENTAL COMPONENT OF SUCCESSFUL HORSE TRAINING IS GAINING TRUST AND RESPECT SO THE HORSE WILLINGLY ACCEPTS YOUR LEADERSHIP. Although trainers often use the terms “alpha horse” and “dominance”, horse owners often misunderstand these terms. They believe it means bullying the horse and demanding absolute submission. How many of us would trust a leader who treated us that way? As an example, the Crosses explain how they teach wild mustangs to trailer without resistance or fear. We all know the trick of putting grain just inside the trailer door and allowing the horse to eat and thereby come to associate the trailer with food. But how about the added “wrinkle” of taking the horse away from the grain before it is finished? If you were the horse, what would you be thinking? Maybe something along the lines of “how fast can I get back into that trailer so that another horse doesn't get my grain?” You bet. According to AnnMarie, her mustangs become impatient and try to get back into the trailer as quickly as possible—a little farther and a little farther—to get that last bit of grain. Getting into the trailer becomes something the horse chooses to do rather than something he is being forced to do. They also emphasize making sure the horse respects your space. How do you do this? By applying pressure to the horse’s ribs a foot or so behind the shoulder where an alpha horse would apply a nip or jab.as discipline. This seemingly minor technique produces a huge response from the horse, causing him to move sideways away from the handler, thereby respecting the handler's space. This training also transfers to work under saddle. When the rider applies pressure in the same place using the lower leg, the horse yields and moves off. Try these quick and simple techniques to transform a scaredy-cat or challenging horse into a confident, cooperative one.